Loud Snoring? Sleep Apnea is Life-Threatening! Sleep apnea is a serious medical condition interfering with sleep of partners as well. Snoring has been a bane of human sleep for eons. Sometimes it is benign, but increasingly our lifestyle has brought snoring to the level of a serious medical condition — Sleep Apnea. Dr. Mercola, a reliable medical blogger, estimates that 75% of people who snore have some degree of sleep apnea when tested. Fortunately, there is a night and day cure for sleep apnea. It is nontoxic and miraculous! So there is hope! Technically, sleep apnea is a pause or complete stoppage of breathing that may last from seconds to minutes, followed by a compensatory gasp or snort. It can be a complete stoppage, or a relative shallowing of breathing. There are basically two types, or a mixture of them: obstructive sleep apnea (OSA — far and away the most common) or central sleep apnea. About half of men, and a quarter of women, from middle-age and above have at least mild sleep apnea. Interestingly, women have more serious cardiac consequences according to a 14-year progressive study measuring a cardiac marker and evaluating cardiac enlargement [New York Times, 10/19/15]. Sleep Apnea is diagnosed by a sleep study called a Polysomnogram (PSG). It can be done in a sleep laboratory overnight or even at home with WiFi connections. You wear contacts on your scalp, chest, extremities, and a finger. No needle sticks! Measurements are made of brain activity, breathing depth and rate, O2 levels, eye movements, and blood pressure. Recordings measure the frequency of complete and partial apneic episodes per hour. Mild sleep apnea is indicated by 5 to 15 episodes per hour. Moderate is 15-30 per hour. And severe sleep apnea is 30 or above. Mild sleep apnea can be dealt with by lifestyle, but severe sleep apnea is considered a serious medical condition. When breathing stops, the brain detects this and triggers the gasp or snort. All this happens during sleep, though. People with sleep apnea are actually struggling as if in a life-and-death struggle, with high blood pressure and rapid pulse and low oxygen. Yet, the victim has no memory of all this! They think they have slept through the night, yet feeling exhausted during the day for no “good” reason. Doctors often mis-diagnose fibromyalgia or chronic fatigue syndrome without recognizing the true cause! The most common cause of sleep apnea is weight gain. Tissues of the palate and surrounding the throat are loose during snoring. As weight is gained, these tissues thicken and narrow the throat. In kids with enlarged tonsils the same thing can happen. It is known that men with necks thicker than 17 inches in circumference are more prone, as are women with necks greater than 15 inches in circumference. In the more rare Central form, alcohol use, medications, and cigarette smoking can lead to sleep apnea. Of course, snoring is a necessary feature. A prime characteristic is snoring loudly enough to interfere with others’ sleep. An old joke during Stanford’s pioneering research was that it is diagnostic of sleep apnea if someone’s snoring wakes someone in another room! Far and away, the most common symptom is daytime sleepiness. Of course, this is also a sign of sleep deprivation if you are getting less than 8 hours sleep. However, if you sleep 8 hours and still have daytime sleepiness, a sleep study is indicated. It is common to wake with dry mouth and/or headache because of the severe struggle during the snoring-laden night. What Are Health Effects of Sleep Apnea? Starting at Stanford more than 50 years ago, an entire medical specialty grew up around sleep research, including sleep apnea. The main pioneer, William C. Dement, did an early anecdotal test. He went to an Internal Medicine practice specializing in chronic diseases including heart disease, high blood pressure, heart failure, and many others. Dr. Dement did free sleep studies on all the people in the waiting room. Nearly ALL of them had sleep apnea. When offered the appropriate CPAP treatment, the vast majority were able to get off nearly all their medications! Health effects are very serious and widespread. 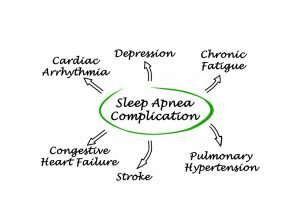 With severe sleep apnea, common consequences are high blood pressure, heart attack, stroke, diabetes type 2, obesity, metabolic syndrome, car accidents, and even depression and irritability. There are some correlations, though unproven as causation, that asthma and acid reflux are enhanced by sleep apnea. Even gout shows a higher correlation. As you can readily see, these consequences can evolve into a vicious cycle! Obesity (which is an epidemic in the modern world!) leads to sleep apnea which in turn leads to obesity and diabetes. And the strain finally leads to heart disease and heart failure. Fortunately, there is a very effective cure! 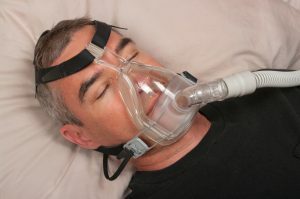 Once sleep apnea is diagnosed, the sleep specialist can fit you with a CPAP machine. This pushes air through your mouth under pressure so you are not deprived of oxygen! CPAP is “Continuous Positive Airway Pressure.” This is only on inhalation, which is usually enough. Some people need more continuous pressure during both inhalation and exhalation, so there is a more advanced BlPAP. CPAP technology is improving rapidly these days. Machines make less noise, and masks are easier to fit efficiently. A common complaint for many people is adjusting to having to wear a mask. Of course, this does not feel natural and does take a little time to get used to. Nevertheless, people typically feel so much better — truly “night and day”! — that this inconvenient adaptation is worth it! For people with mild sleep apnea, a few simple things can be done. Sleeping on your side helps. Using decongestants or Breath-Rite strips helps to open the nose. Some people even try to retrain themselves to breathe through the nose by putting a strip of tape to hold lips together. I agree that this is a serious issue, but what if one cannot sleep with the CPAP machine? Can homeopathy help overcome apnea? Well, most people do learn to adapt if they stay with it. They are motivated because it works so well. Sleep apnea usually is a mechanical problem so homeopathy cannot help except to deal with whatever underlying problem there might be causing obesity. I think that a lot of people completely underestimate just how vital sleep actually is. We depend on a restful sleep cycle in order to rejuvenate our cells, grow muscle, and repair damaged tissue – along with many other processes. Plus, anyone who has ever had to deal with a night of restless sleep knows exactly how agonizing it can be to get up bright and early, get your day started, and have the ability to to concentrate on the daily tasks you need to concentrate on. While I was doing research for a recent article, I found that the CDC has presented data showing that one-third of adults do not sleep close to as well as they should. It’s completely unacceptable how we’re affecting our bodies when we don’t get enough quality sleep. Thanks for your comment! I completely agree with all this. Actually, I’m surprised that CDC data speaks of only one third. I would guess the number who are sleep deprived is much higher.